It doesn't happen all that often, but today the wind blew and we locked ourselves out of the shop. We urgently needed a man. 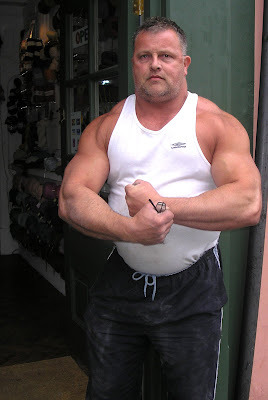 This is Kenneth James Baker, possibly the strongest man on Globe Rd. You might recognise Ken because he has been a stunt man in Casino Royal, in an advert with David Hasselhoff, and a double for a Crimewatch re enactment on serial killer who killed lots of blonde women. Ken works out every day and has a 56" chest, and he can do the splits. He pushed the door open with a light touch and we agreed to knit him a new vest. BIRTH - BABY OWEN'S BOOTS.